For this to happen in our lives, we must believe in God the Father and that Jesus is His only begotten Son; be truly sorry for our sins and determine not to do them any more; ask Jesus to be our Savior and forgive our sins; obey Him and be immersed in water baptism in the name of the Father, the Son and the Holy Spirit; then we must live faithfully from then on. Only those who do this will be saved. All others will face eternal punishment in a very real hell with no escape. Salvation is free for everyone. Jesus paid the price for us on the cross. We have only to come to Him and take Him as our Lord and Master and He will save us. I pray you make this decision today. We are not promised the next hour. 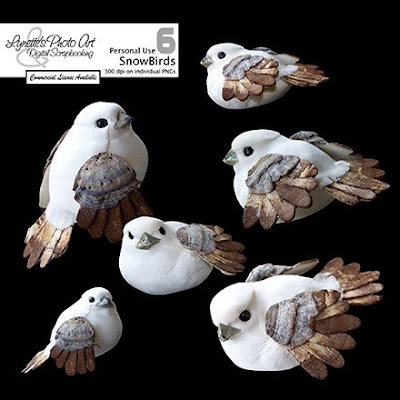 Today's download is one I'm very proud of...my lovely Snow Birds! There is a beautiful QP I made of it still available in the archives in the left column. Thank you so much for this Freebie. I want to let you know that I posted a link to your blog in Creative Busy Hands Scrapbook Freebies Search List, under the Elements Only post on Jan. 04, 2009. Please, notice that I've changed my url. Thanks again and Happy New Year. Thank you! These are just too sweet! These are super adorable. Thank you! Just so cute! Thanks for sharing. very nice indeed , thanks a lot ! These snow birds are soooo adorable ! Merci BEAUCOUP !! Once again thank you ever so much for your great work ! I love these little snowbirds as much as the marshmallow snowmen. Thanks so much. These little birds are simply adorable! Thank you ever so much in sharing your incredible talent! Adorable snowbirds; thanks so much for sharing!